The display options available for an opt-in determine where and for whom the opt-in should be displayed. Homepage – Activating this setting will result in displaying the opt-in on the homepage of your website. Posts – Activating this setting will result in displaying the opt-in on all of your posts. 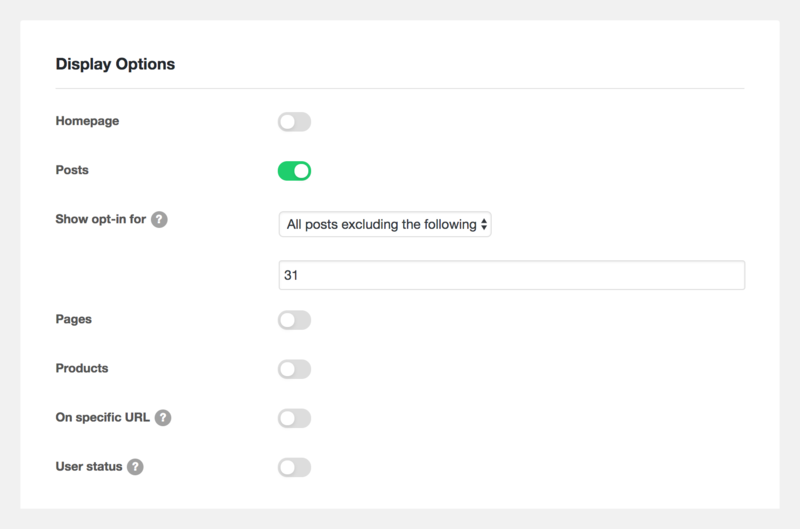 You can further filter on which posts by selecting the Show opt-in for option and then entering a list of post ids you want to exclude or include. Pages – Activating this setting will result in displaying the opt-in on all of your pages. You can further filter on which pages by selecting the Show opt-in for option and then entering a list of post ids you want to exclude or include. Products * – Activating this setting will result in displaying the opt-in on all of your WooCommerce products. You can further filter on which products by selecting the Show opt-in for option and then entering a list of product ids you want to exclude or include. On specific URL * – Activating this setting will permit you to add a list of URL, separated by comma, where you want the opt-in to be displayed. User status * – Activating this setting will permit you to filter if the opt-in should be displayed for only logged in or only logged out users. Please note: After making changes to these settings clear your cache so that the changes take effect. The trigger options available with determine when the opt-in should be displayed. After user scrolls – Activating this setting will permit you to specify after what scroll distance, in percentage, should the opt-in appear on the screen. 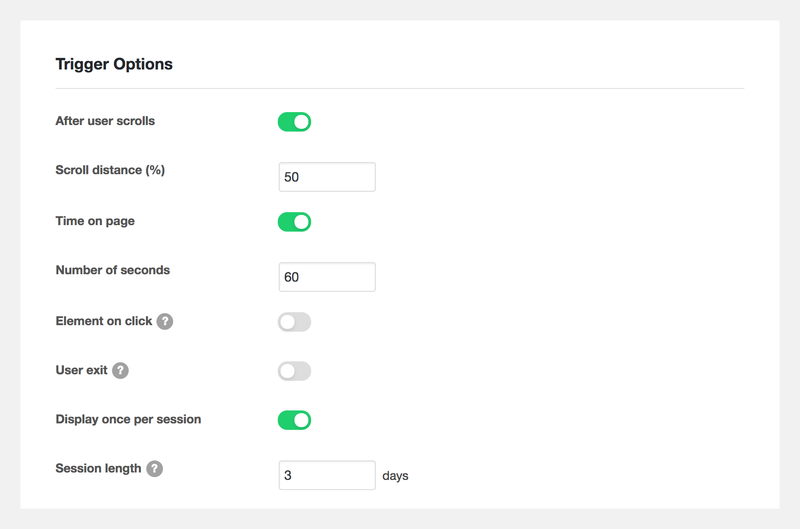 Time on page – Activating this setting will permit you to specify after how many seconds since the user reached the current page should the opt-in appear on the screen. Element on click * – Activating this setting will permit you to enter CSS class and id selectors, separated by comma. Elements with these classes and ids, when clicked, will trigger the display of the opt-in. User exit * – If activated the plugin will determine the user’s cursor movement and when the user tries to exit the webpage and triggers the display of the opt-in. Display once per session – Activating this will permit you to define the session length. The opt-in will be displayed only once per session duration.